We’ve had a wonderful spring here in Phoenix, Arizona – cool by our standards and it even rained here for the first time in recorded history earlier this month. But now the sun is back and it is beautiful. I can’t say I like every single hot day here, but all in all I like the heat. And I like the sun. It was rumored, in fact hoped, that the Philae lander might wake up from its slumbers when summer approached. If you recall, the Philae lander is the first ever probe to make a soft landing on a comet, 67P/Churyumov-Gerasimenko, but due to how it landed, it bounced a few times and settled in some shade. No good for its solar panel powered batteries and it soon fell silent once those batteries were drained. We were so close. 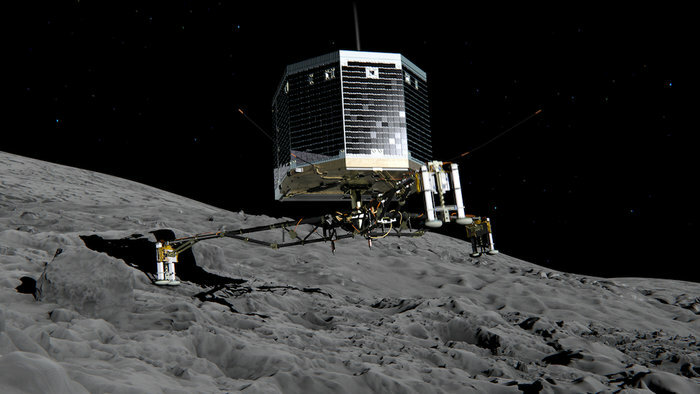 DescriptionStill image from animation of Philae separating from Rosetta and descending to the surface of comet 67P/Churyumov-Gerasimenko in November 2014. There was a hope that wherever it was and however it was shaded, that once summer approached it might be exposed to some sunlight; enough sunlight to charge those batteries back up and get the show back on the road. But hope is no strategy, and I got the feeling that it was considered a long-shot it would ever wake up. More than likely, the probe was lost. Amazingly, somehow someway, however the little washing-machine sized probe is positioned, it is getting enough sun to juice up and communicate. Really good news. This last link has a short, informative video and there are some snippets of in Italian – what a cool language that is. Anyhow, it looks like all is well in this season of sun. good to have an update on Philae and it’s nice to hear that it may have a life still. Also, the George Harrison video has some great iconic photos!